2. EINSTEIN SAID THAT IF THERE WAS ANY ETHER IN SPACE, THEN HIS THEORY IS NULLIFIED. HE SAID : If Michelson-Morley is wrong, then Relativity is wrong. (Einstein ; The Life and Times, p. 107.) So, Einstein simply dismissed the fractional ether drift of MMX as a mere artifact. But the sad fact is, scientifically speaking, artifacts would not have appeared in all the dozens of interferometer experiments performed over the next 80 years. In 1921, Einstein wrote to a friend that if "the Miller experiments" produced positive results *"the whole relativity theory collapses like a house of cards." Miller's experiments produced consistently positive results. The experiments of Sagnac and Michelson & Gale are rarely mentioned. Until recently it was quite difficult to find a reference to them. As Dean Turner pointed out "One may scan Einstein's writings in vain to find mention of the Sagnac or Michelson-Gale experiments. The same can be said of general physics text-books and of the McGraw-Hill Encyclopaedia of Science and Technology...Such an oversight constitutes a stinging indictment of professional scientific reporting". It is indeed quite difficult to get information on these experiments. They seem to be such an embarrassment to relativity that those who know about them would rather not say too much. Quite a number of relativity experts, however, do know about them, and when pressed many admit that they show the Special Theory of Relativity (the theory taught to all science students, and the basis for much of "modern physics") to be inadequate. 4. It is rather interesting that Relativists, on the one hand, claim that light is limited to 186,000 mps in Special Relativity, but admit that Special Relativity does not incorporate gravity or inertial forces. is limited to light speed? with inertial frames? This shows that the two theories of Relativity contradict themselves. 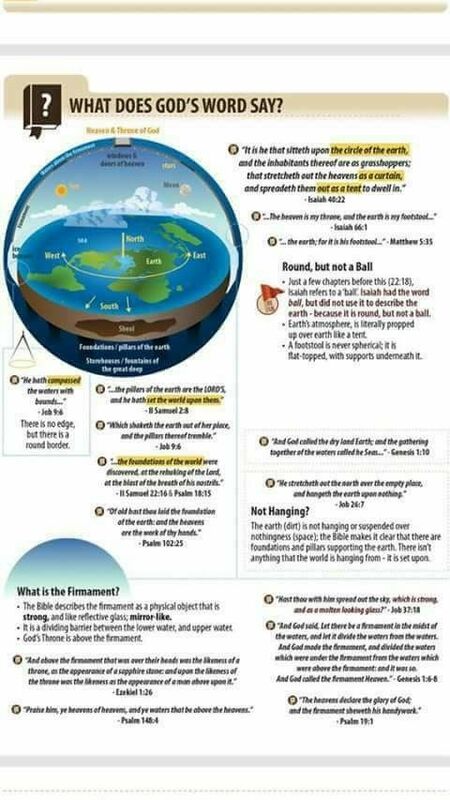 Flat Earth Disinfo Campaign - Why, if it's Only Fantasy? This a rock band from St. Louis, my town, from 1975. As a flat earther I find the band name "Head East" and the debut album title of "Flat as a Pancake" rather interesting. I've heard this song all my life and never thought of it until just now. Did they know just like Lennon and Pink Floyd? Anyway, great song. What we have in the history of western science is a fully formed highly detailed geocentric cosmology and mathematical astronomy in the form of the Syntaxis Mathematiké from Ptolemaeus from the middle of the second century CE. This lays out in great detail all of the arguments for and against both the geocentric and heliocentric cosmologies known to the Greek astronomers and cosmologist over a period of about six hundred years. Not exactly fragments of ideas! These arguments are logically argued scientific hypotheses based on solid empirical observation made by Babylonian and Greek astronomers over a period of approximately nine hundred years. Thanks to Ptolemaeus we know exactly why geocentrism was the standard. A standard that was accepted and defended in the works of Plato, Aristotle and many other Greek philosophers and mathematical commentators. This standard was also maintained and defended by many, many Islamic philosophers and astronomers from about 800 CE into the Early Modern Period. The geocentric hypotheses of Greek and Islamic cosmology and astronomy were not based on religious beliefs but on solid empirical observations. The religious views of the astronomers and cosmologists who presented those hypotheses did not play a significant role in their work. However the three main players in the introduction of heliocentric cosmology in the Early Modern Period Copernicus, Kepler and Newton (contrary to popular opinion Galileo only played a very minor role) were all deeply religious and the religious views of two of them did play a highly significant role in their scientific thought. The Bible tells us, but nobody wants to believe it. YouTube took my main channel down and it killed most of the videos I've posted over the last 8 months. Sorry folks but it will take some time to find these videos again. The censorship is getting really bad now. Can You Debunk Flat Earth?